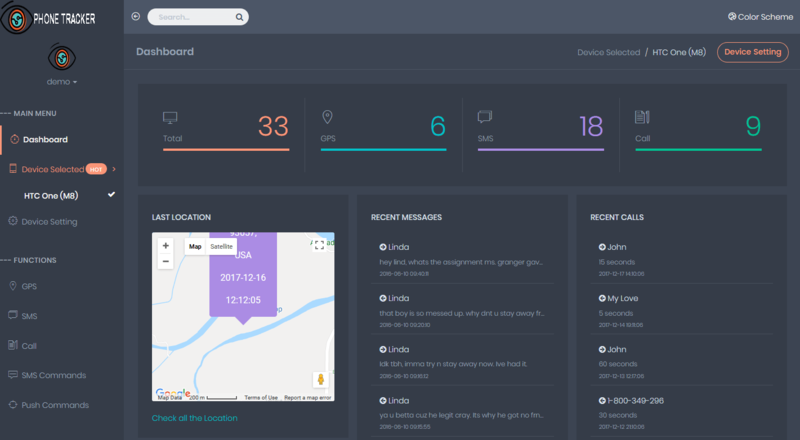 Phone Tracker is a monitoring tool with the help of which you can spy on the smart devices of other people. This application comes with many different features to help its users get the best spying experience and to clear away all their doubts. 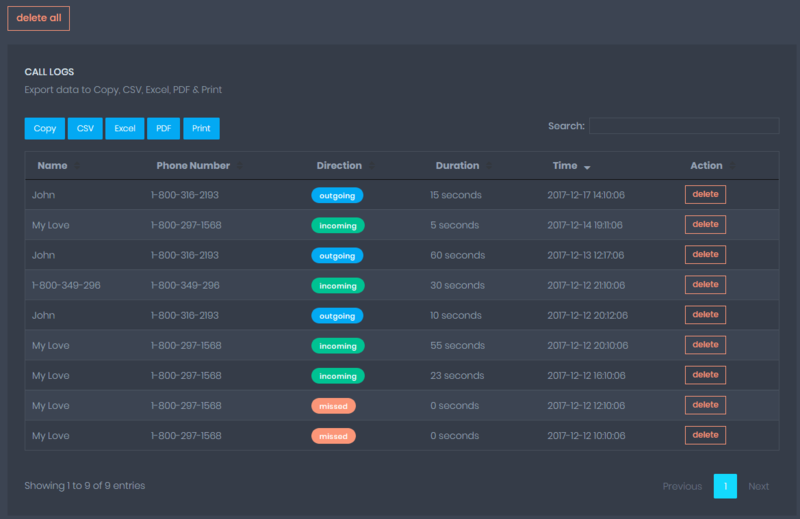 Phone Tracker is fast, simple to use and free of cost. It gives all the benefits that you will be getting in a top most and top paid application. It assures you that you will be getting all the accurate and real time information of the suspect. This application is efficiently capable to inform you about all the activities that the suspect does over his smart phone including the phone call, messages, media and information about other activities as well. Everything is all good about this software but the service that can catch you is its ability to remotely control the other device. This feature comes inbuilt with this application where you can record all the calls in real time without any difficulty. As soon as the suspect gets any call, you will be notified via a notification and then you can record the call as soon as the call starts. The best part of this recorder is that the suspect and other party will never come to know about your presence or their call being recorded. It is totally silent and safe feature. You can not only listen to the call live but can also record and save it for later reference. These audios and recordings are saved on the online portal of the account you made with Phone Tracker. Get the software- first you will have to find the application of Phone Tracking that suits your device the best. Though this app is compatible to almost all the operating systems and smart phones, you can get assurance by yourself. Download the app- after knowing all the features if this application and knowing about it, you will have to download the app in your device as well as in the phone of the suspected person. The procedure of download is just like the other applications. Install and set up- after downloading the app, you will need to install it. Set up an account on the application so that you get all the necessary information there after installing the application. Make sure the app is properly installed in the device before moving on to the next step. Hide the app- if you do not want that the suspect comes to know about your spying, you can hide the application as well. You have to go to the options section and then click on the hide option. By hiding the app, the suspect wouldn’t be able to sense the presence of the application on their device. Get started- once all the above given steps are completed you are all set to use the Phone Tracking app. Take a test drive of the app and you will understand all the ways to use it. The social media accounts used by the suspect on their phone can be traced by you. You can know all the activities that the person is carrying out over his or her social media account. Along with the posts and comments made on the social media, you can also get access to the social media chats of the person. 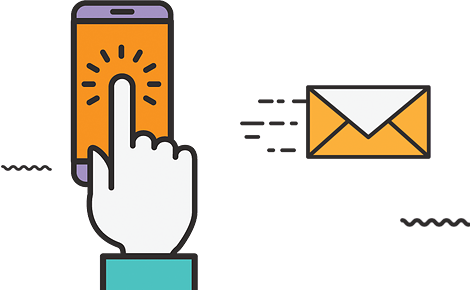 You get access to the messages that the person sends or receives. It lets you read all the messages along with its other details like the date and time, the details of the other person etc. you can also read the hidden messages if any over the phone. Phone Tracker is blessed with one of the best position tracking unit. The GPS system in this application is very effective and efficient. The current location of the suspect will be traced and informed to you in real time. The location is shown against a map for you to understand it better. This is one of the most important features of Phone Tracker app. This feature is most helpful for the parents and employers. It helps you in knowing what amount of internet the suspect has used in a day. It will also let you know what portion of internet has been used by which application present on the phone. It is beneficial for the parents to control the internet use of their children. You can have access to the call logs and contact list of the suspect's phone. With this feature you will get to know the calls, made and received details and duration of the call and other people in contact as well. The files like audios, movies, videos and other multimedia stuff such as photos in gallery can be traced by the Phone Tracker app really easily. You will know what kind of documents does the suspect saves over his phone.